Terry Tempest Williams urged Utah lawmakers to get behind Senate Joint Resolution 10, which asks Congress and the President to protect the Greater Canyonlands area. Utah Public Radio, February 8, 2013. Also, an article in the Salt Lake Tribune. In celebration of it's 30th anniversary, Orion has published Thirty Year Plan, a collection of thirty original essays from luminaries who are actively thinking and acting on sketching out an agenda of forward and thoughtful movement regarding the landscape of change pertaining to environmental issues. Terry has the final chapter in the book. Find out more here. Terry and Orion Editor Jennifer Sahn were interviewed about the new book on WAMC, Northeast Public Radio. Read an article by Terry Tempest Williams with stunning black and white photographs by Sebastião Salgado in the April 2012 issue of Condé Nast Traveler. Read Terry Tempest Williams' column published in The Progressive magazine in April, 2012. Read excerpts from Terry's previous columns in The Progressive here. 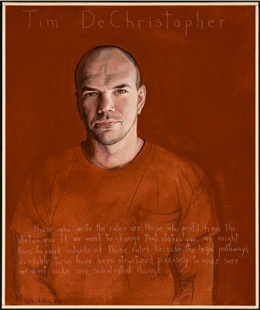 An excerpt from Terry's column in The Progessive magazine, September, 2011, on Tim DeChristopher's message is available online here. The Community of Christ International Peace Award was presented in 2011 to Terry Tempest Williams in recognition of significant peacemaking vision, advocacy and action. Watch online here. "Arctic Refuge: A Circle of Testimony," a book published by Milkweed Editions in response to the call for drilling in the Arctic National Wildlife Refuge. Terry Tempest Williams is currently a member and on the Board of Directors of the Southern Utah Wilderness Alliance. She is also a member and on the Board of Directors of the Compton Foundation. Terry is a contributing editor to Orion Magazine. Abbey's Web is dedicated to the life and work of author Edward Abbey. Article about Edward Abbey, "A Desert Anarchist's Legacy", 10 years gone. Writer, artist, and naturalist Ellen Meloy. Association for the Study of Literature and Environment. Terry Tempest Williams was inducted to the Rachel Carson Honor Roll and has received the National Wildlife Federation's Conservation Award for Special Achievement. She has been a fellow for the John Simon Guggenheim Memorial Foundation (1997) and received a Lannan Literary Fellowship in Creative Nonfiction (1993). In 1999, Ms. Williams received "The Spirit of the West" award from the Mountain-Plains Booksellers Association for Special Literary Achievement. She has also been recognized by the Mormon Arts & Letters Association and honored by Physicians for Social Responsibility for "distinguished contributions in literature, ecology, and advocacy for an environmentally sustainable world." 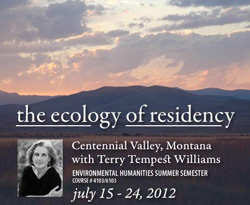 Terry Tempest Williams was the Shirley Sutton Thomas Visiting Professor of English at the University of Utah in 1999. In 2000, Terry Tempest Williams visited the Center for the American West as a Distinguished Lecturer and received the Lila Wallace-Reader's Digest Writer's Award. May 2, 2003, Terry Tempest Williams received an honorary degree of Doctor of Humanities from the University of Utah. In 2004, Terry Tempest Williams became the first Annie Clark Tanner Fellow in Environmental Studies, a three-year appointment conferred by the Obert C. and Grace A. Tanner Humanities Center, in conjunction with the University of Utah, College of Humanities. In this capacity, she will facilitate a series of naturalist lectures, similar to Henry DavidThoreau's 19th century Lyceum Lectures, and will teach an annual course in nature and writing within the setting of Utah's red rock country. 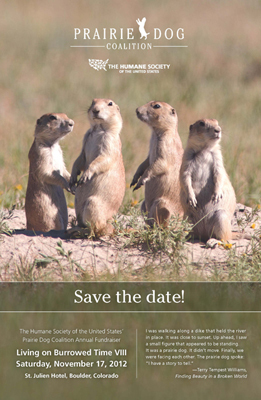 Named for one of the founders of The Wilderness Society, the Robert Marshall Award is The Wilderness Society’s highest honor given to a private citizen. In September 2006 it was awarded to Terry Tempest Williams. In 2006, Terry Tempest Williams also received the Distinguished Achievement Award from the Western American Literature Association. She is also the recipient of the 2010 David R. Brower Conservation Award for activism.